Desktop is keeping pace with mobile when it comes to email conversions according to new data from Movable Ink. The company’s quarterly U.S. Consumer Device Report reveals that while mobile email opens increased in Q2 2015 (68 percent from 67 percent in Q1), desktop conversions also grew and even slightly overtook mobile. In fact, desktop conversions rose to 53 percent while mobile conversions remained at 47 percent. Within mobile conversions, the data found that iPhones remain dominate, accounting for 19 percent, while Android accounted for 10 percent of conversions and other mobile devices (including the iPad) accounted for the remaining 18 percent. In addition to conversion rates, the report broke down email opens by the time of day, industry vertical and geography, as well as the length of time consumers spend reading an email per device. For example, the data shows that tablet users tend to spend less time in the inbox, with more than 75 percent of iPad users and 58 percent of Android tablet users spending an average of 15 seconds or less reading emails. 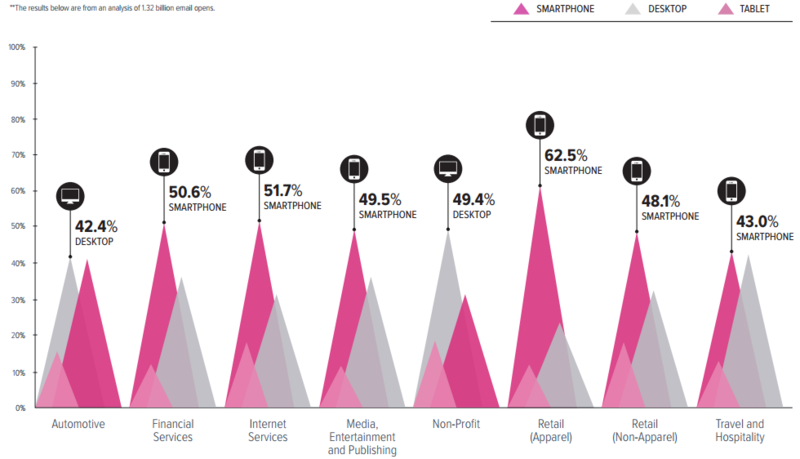 What’s more, mobile opens dominate across industries, with the only exceptions being the automotive (42 percent) and non-profit (49 percent) verticals (check out more data in the image below). Lastly, the data shows that email opens peak on smartphones in the morning around 6:00 a.m., while desktop opens peak around 11:00 a.m.